Seven companies currently dominate the global production of pesticides and seeds, a key sector in agriculture. But this oligopoly will shrink if the EU and US competition authorities give their green light. The two US corporations DuPont and Dow Chemical have merged, ChemChina has bought the Swiss company Syngenta, and the German chemical giant Bayer is going to take over the US company Monsanto. Three newly-formed conglomerates would dominate more than 60 percent of the market for commercial seed and agricultural chemicals. They would manage the supply of almost all the genetically modified plants on this market. They would also own the majority of patent applications for intellectual property rights for plants at the European Patent Office. The new Bayer-Monsanto would be the world’s largest agricultural corporation, holding one-third of the global market for commercial seed and a quarter of the market for pesticides. Bayer has agreed to buy Monsanto for US$ 66 billion. Bayer-Monsanto and DuPont-Dow will remain on the stock market, and will continue to be accountable to their shareholders. The management of DuPont-Dow plans to split the new group into three listed companies, one of them an independently operating agrochemicals company. ChemChina, a state-owned firm that is China’s biggest chemicals producer, has also agreed to pay an eleven-digit figure, US$ 43 billion, for Syngenta. Along with Syngenta’s pesticide and seed production, ChemChina, already a producer of non-patented chemicals, will gain an enormous amount of knowledge on genetic engineering despite resistance by many Chinese about using this technology in farming, and doubts over whether the Chinese government will support the introduction of genetically modified plants. Whether Syngenta’s new owners will list parts of the company on the stock exchange is unclear. Bayer is financing the takeover of Monsanto with US$ 57 billion of loans. Its board argues that the enormous potential of global agricultural markets justifies the price, and taking on so much debt. It expects the global turnover of seed and pesticides to increase from US$ 85 billion in 2015 to US$ 120 billion in 2025. For comparison: in 2015 Bayer and Monsanto had a turnover of US$ 25.5 billion and a profit of US$ 5 billion. Bayer AG, the world’s tenth largest chemicals manufacturer, has expanded into seeds by acquiring other companies. It has joined the league of large multinational seed corporations, following in the footsteps of other chemicals companies. Five of the world‘s seven largest seed producers come originally from the chemical industry: Monsanto, DuPont, Syngenta, Dow and Bayer. 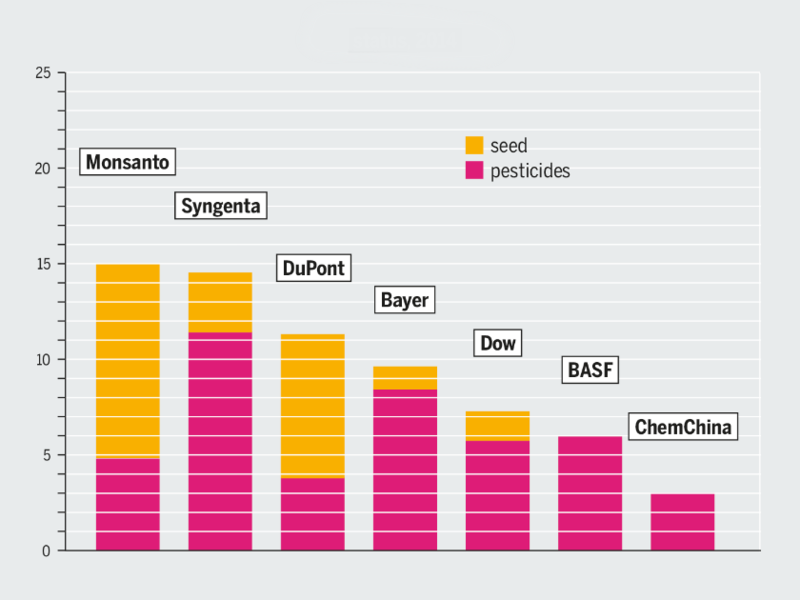 No other company has swallowed more competitors in the seed sector than Monsanto. This corporation began buying up seed producers around the world in the 1990s and now dominates a quarter of the world’s commercial seed market. It owns rights to most of the genetically modified plants, but also sells many conventional seeds, in particular vegetables. Monsanto’s presence is difficult to detect because the companies it controls often keep their original name; Monsanto’s logo rarely appears on a seed package in Europe. 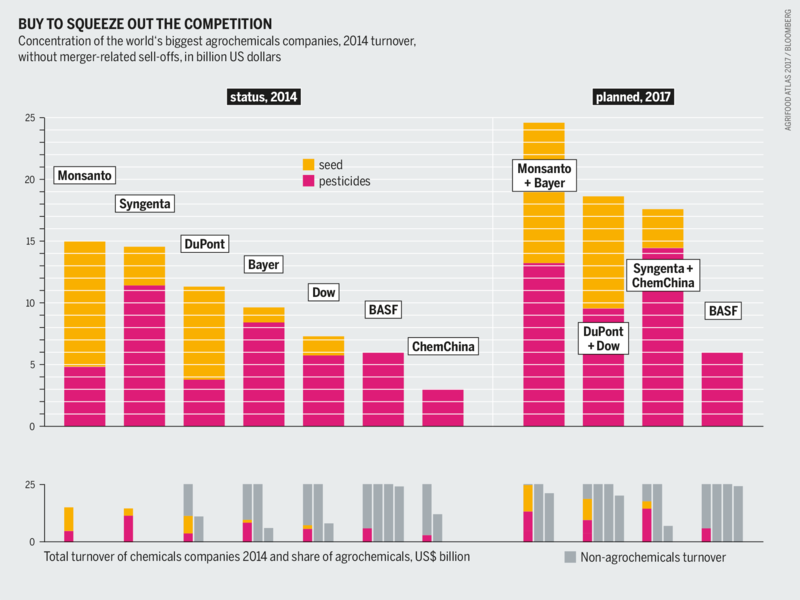 The narrowing of the oligopoly from six or seven to three members will bring Bayer-Monsanto, DuPont-Dow and ChemChina-Syngenta closer to their objective of dominating seed and pesticide markets and dictating products, prices and quality standards. All three groups are pursuing the strategy of ousting other suppliers and eliminating competitors, if necessary through acquisitions. Thirty national antitrust authorities worldwide are analysing these mega mergers. The European Commission has ruled that DuPont must sell off some of its pesticides as well as its research and development branch. To squeeze past the regulators Bayer is forced to sell off its South African business in genetically modified cotton, as well as its Liberty Link crops and chemicals. Other corporations want to benefit from the wave of mergers by buying up business segments that the merging companies have to sell off. 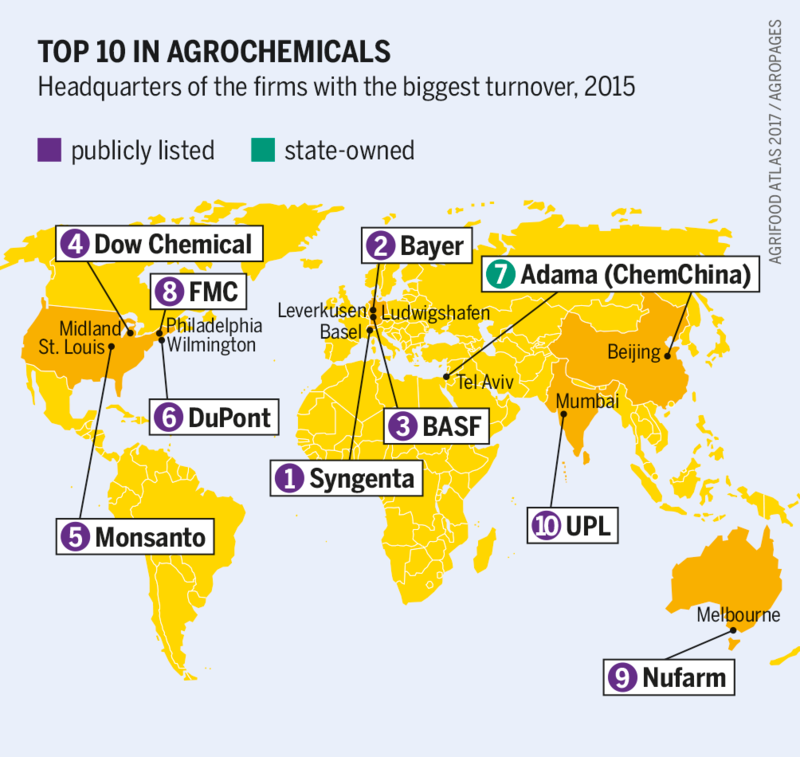 US-based FMC, formerly known as Food Machinery and Chemicals Corporation, has benefited from the Dow-DuPont scraps, buying some of their pesticides and research departments, making them currently the 5th largest valued pesticide producer in the world. The German company BASF is also buying sell-offs from the mergers. The bigger a multinational, the more power it has to lobby politicians and to influence legislation. Bayer could soon become the world’s number one in the seed and pesticide sector. The group is under pressure because of its high debt, but is certain of the support of Germany, Europe’s economic giant. A risk is that the new German global player and its political allies could target the fundamental achievements of EU legislation. These include the principle that the safety of pesticides must be demonstrated before they can receive EU approval: i.e., they do not cause cancer, affect reproduction, damage embryos or the hormone system. 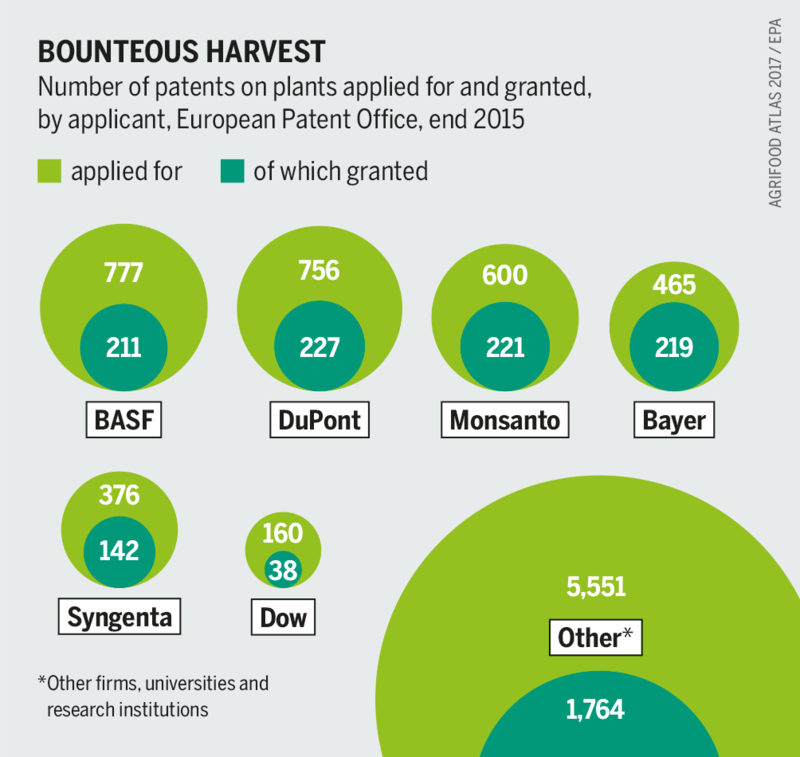 Bayer is likely to try to alter the licensing and labelling requirements of genetically modified plants, portraying these rules as obstacles of growth and trade. Big tasks lie ahead: Whoever secures genetic material through patents will control the seed sector and will influence agriculture, food production – and ultimately world food security.